I think you and I may be leaves on the same family tree! According to the relationship chart below, your mother (or grandmother, great-grandmother, aunt, sister, sister-in-law, spouse’s cousin) Alice Hester Clarke Jenkinson was my first-cousin thrice removed. That may sound distant but consider this; Alice’s father Elmer and my 2nd great-grandfather were brothers. 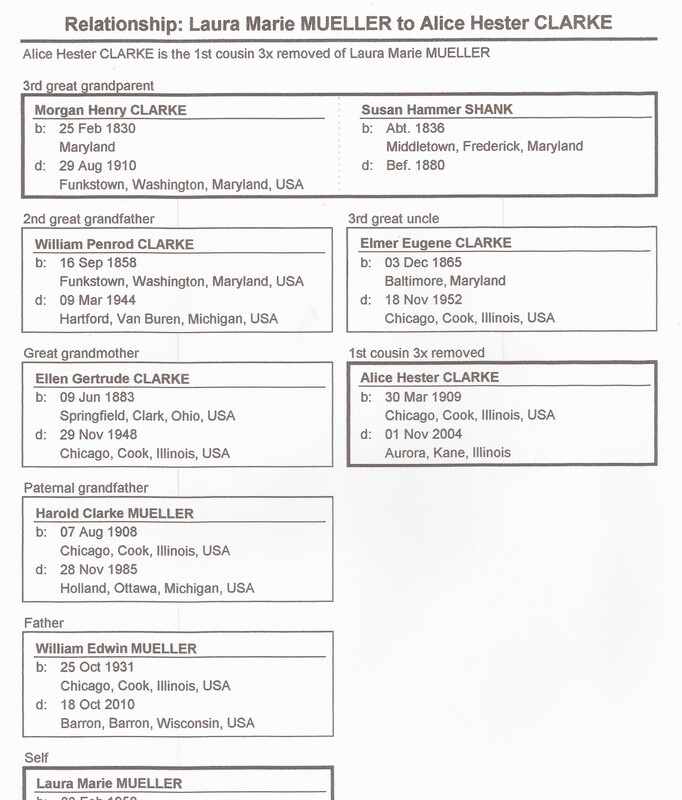 Elmer and William Clarke were two of at least 11 children born to Morgan Henry and Susan Hammer (nee Shank) Clark/e. I’ve traced our family back to Maryland in the late 1700s but I don’t yet know for certain the country from which our ancestors immigrated. Perhaps you or someone in your family has done family history research? Or maybe you know of a family Bible or photo album with clues about our Clarke genealogy? Alice has been on my mind recently because as you know, she died on this date 12 years ago. When the 1940 census was taken, Alice and her husband Harry were renting their home at 4451 N Mason Avenue in Chicago for $35 a month. Harry was 41 and worked as a office manager for a tool and die manufacturer. 31-year-old Alice was a stay-at-home mom. She and her two youngest children 12-year-old Robert and 10-year-old Barbara had been born in Illinois. 16-year-old Margery, the oldest child had been born in Indiana like her father. Both Harry and Alice had completed one year of high school; Margery had completed two years. The family had lived in this same home for at least the previous five years. In April of 1930, Harry C and Alice owned their home (valued at $7500) at 3545 West 60th Street in Chicago. Harry was an accountant for a commission house. He and his father were born in Indiana, his mother had been born in Pennsylvania. Harry was 31 years old, he’d gotten married when he was 20. Alice was 21, married at 18, born in Illinois as was her mother. Her father had been born in Maryland. The couple had three children; Marjorie 6, Robert 2-3/12, and Barbara 9/12. Marjorie attended school. Ten years earlier when the 1920 census was taken, 10-year-old Alice, her parents Elmer E. 54 and Susan 48, her brother Elmer E 19 and sisters Stella 16, Edna 13, Eloise 8, Irma 6 and Dorothy 1-6/12 all lived at 646 Lorel Avenue in Chicago. Alice’s father Elmer and his parents had been born in Maryland; her mother Susan had been born in Illinois to German immigrants. Elmer worked as a sheet metal welder and the couple owned the family’s mortgaged home. Alice’s brother Elmer was an office clerk and sister Stella was a telephone operator. Edna, Eloise, Irma and Alice attended school. One-year-old Alice was the youngest of the seven children living with Elmer E and Susie E when the 1910 census was taken. The family resided at 3042 South 41st Street in Chicago, a home the family owned free of a mortgage. Elmer was 44, Susie was 38; both were 18 when they got married. This census shows Elmer’s and his father’s birthplace as Maryland; his mother’s as Pennsylvania. Susie was born in Illinois; her parents were immigrants from Germany. Elmer was an iron moulder. Alice’s 16-year-old brother Lyman was an office clerk, 14-year-old brother Clifford. M was a newspaper agent. Alice’s siblings 12-year-old Zora S., 9-year-old Elmer E., and 7-year-old Stella A. attended school. That brings us back to Alice Hester Clarke’s birth in Chicago on 30 Mar 1909. She was Elmer Eugene and Susan (nee Berg) Clarke’s seventh child. I would love to connect with you and learn more about this branch of our family tree. I’m especially interested in our shared ancestors, Alice’s grandparents Morgan Henry & Susan Hammer (nee Shank) Clark/e and Morgan’s parents Mathias/Mathew & Rebecca (nee Ridenour) Clark. Mathew was born in Maryland about 1798; his parents may be our immigrant ancestors possibly from Germany or Switzerland. Please drop me a line by email at where2look4ancestors [at] gmail [dot] com or leave a comment on this blog. I look forward to getting to know you! 1909 FamilySearch, Salt Lake City, Utah. Illinois. Cook County Birth Registers, 1871-1915. Illinois Department of Public Health. Division of Vital Records, Springfield. 1920 Census Chicago, Ward 33, Cook, Illinois; Roll T625_353; Page 4A; Enumeration District 2120; Image 472. 1930 Census: Chicago, Cook, Illinois; Roll: 441; Page: 14B; Enumeration District: 0582; Image: 226.0; FHL microfilm 2340176. 1940 Census: Chicago, Cook, Illinois; Roll: T627_1004; Page: 3B; Enumeration District: 103-2611. 2004 Social Security Death Index, Master File. Social Security Administration. Clever idea to write up the post to attract possible cousins—do you have some specific people in mind, or are you just hoping someone will Google the names and find the post? I’ve had some incredible good fortune with cousins finding me through my blog. Good luck!